(Camden, NJ) – Camden County had two wineries take top honors in the Garden State Wine Growers Association Wine Competition this year. Amalthea Cellars and White Horse Winery, both of Winslow Township, were recognized at a ceremony at the Governor’s Mansion on November 16. Freeholder Director Louis Cappelli, Jr. spoke about Camden County’s continued emergence as a wine growing destination. Amalthea Cellars was presented with the 2018 Governor’s Cup for Best Red Wine for its 2015 Legend’s Edition Europa I. Amalthea Cellars was also awarded Best of Show in the NJ Wine Competition with a score of 97. White Horse Winery earned Best Hybrid White Wine for its 2017 Estate Vidal Blanc. During the presentation, Governor Phil Murphy and First Lady Tammy Murphy announced that only New Jersey wines would be served at Drumthwacket during his administration. The 2018 NJ Wine Competition was conducted for the first time by the nationally renowned staff of the Beverage Tasting Institute in Chicago. Wines were judged as they were submitted all spring and summer with judging ending August 1. 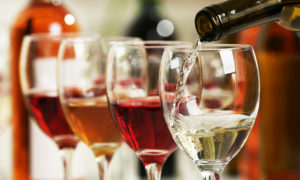 There were 150 wines entered into this year’s competition.